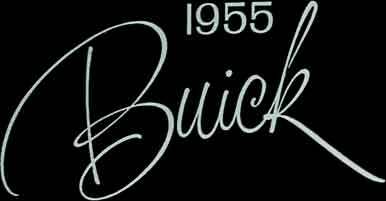 In bringing forth their new 1955 V8 engine, Buick engineers started with what was already the world's most advanced V8 design. ...A V8 more compact than any other such engine of equal displacement -- for greater flexibility in car styling. ...The lightest of all V8 engines with the same power output -- for better balance to the car's total weight, with improved steering, handling and performance. 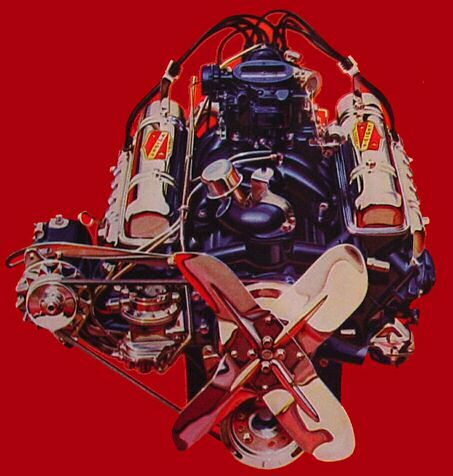 ...A V8 with greater rigidity of a deeper and more heavily flanged "block" and the greatest crankshaft bearing width of any V8 in America, for more freedom from "whip" and engine vibration. ...A V8 with the lowest stroke-to-bore ratio of any V8 engine now in passenger-car production -- shorter stroking pistons that reduce friction, and thus reduce power loss. Now, illustrated here, are the 1955 Buick V8 features which produce such thrilling new performance -- and with new gasoline savings that give you as much as 4.8 miles more per gallon than Buicks of six years ago. Tremendous New Increases in Horsepower -- up as much as 30% over last year, as exemplified by this SUPER Series power chart. Buick brings you higher horsepower per dollar straight across the board with 236 horsepower in ROADMASTER, SUPER and CENTURY Series, 188 horsepower in SPECIAL. New Record-High Compression -- up to 9 to 1 ratio -- gets more drive from fuel charge. New Full-Skirt Slotted Pistons -- permit precision fit with minimum friction -- insure smoother stroking, better balance, less power loss -- continue the lowest stroke-to-bore ratio of any V8 now in passenger car use. New Freer-Breathing Design -- increases power efficiency -- with the new, bigger open throat 4-barrel Airpower Carburetor, oversize T-Type Intake Manifolds, larger exhaust valves and ports, and higher-lift cams. 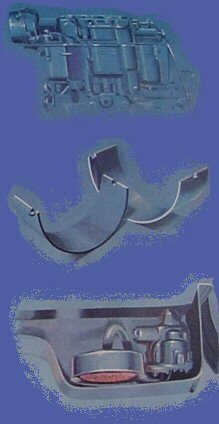 New Moraine Connecting Rod Bearings -- prolong engine life at peak performance. New Constant-Flow Oil Return System -- insures full lubrication under all conditions.